You play as Mr. Jones, who along with your loving dog Kranky, decides to start a graveyard by your home in the country so that you can raise the money to join the love of your life, Mimi, in paradise. But, you have to buy her so many gifts, and have a million dollars spending money before you can go – so your road ahead is long but not too hard. This is one of the great time management games to come out of Big Fish Games that you simply have to try. 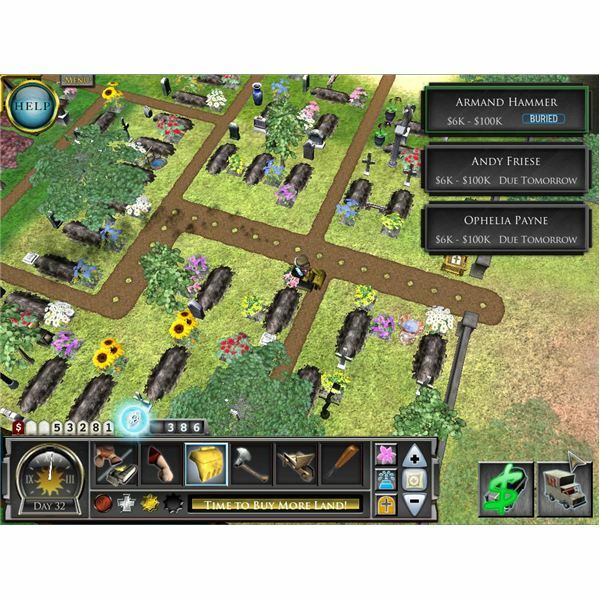 This is one of the many time management games to come out of Big Fish Games, as well as a fun PC strategy game. You have so many different things that you have to keep up with and keep an eye on as you go through it. 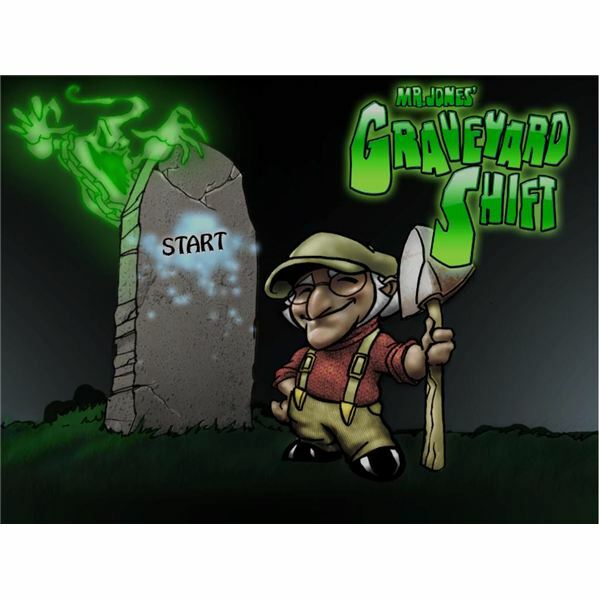 Mr. Jones Graveyard shift is definitely one of those great little PC strategy games that will keep your fingers and brain working. When customers arrive, you will see a car icon in your lower right hand corner and you can click on that to go to that car. They will tell you the name of the person they need to bury, what they would and wouldn’t like around the grave, as well as what they want to spend. You do have to be a bit smart in the beginning and not accept jobs that are too high priced, as you won’t have the ability to do them. Once you accept the job, you then have to dig the grave, put the items around it that they requested, make sure that there is a path by the grave, chisel the name into the headstone, and you’re done. The funeral party will arrive and it’s actually funny to listen to, then the car will then have a "$" sign over it. You go back to the car to collect your money and see how well you did. You will have a supply truck that comes daily to allow you to purchase what you need. And, you can save up money and your reputation medals to buy other plots of land next to your current graveyard so that you can bury more people. Now, after you have buried someone, if the grave price is lowered because you have removed something or there is something that they don’t like placed by the grave, the person will become unhappy and turn into a zombie. You have to then place something else by the grave to get the value back up so that they will go back into their grave happy. You do have to sleep at night, so make sure that you allow yourself time to get things done and sleep so that you can move on to the next day. There are also special graves that you’ll construct, such as a Hand Statue and a pyramid, that will give you extras and bonuses. Some of these bonuses include items that you can place around any grave to ensure that the people are happy and they will pay you full or extra price. As you can see from the screenshots below, the graphics are great in Mr. Jones’ Graveyard shift. They are light-hearted and fun, cartoonish, but still great. The colors are good, the animations are funny, and I love everything about the game’s graphics. Mr. Jones moves funny, which adds to the fun of the game, and your dog Kranky will roam all over the place, just getting in the way. Even the ghosts and the zombies are funny, so you really can’t complain about the graphics in this little game. This is the part of the game that you don’t want to miss. When I first got the game, I played with the sound off until one of my kids asked to hear it. I was sure sorry that I hadn’t heard it until then! I cracked up as the funerals got there, mumbled some incoherent wording (complete with a lady sobbing in the background), then they say "ashes to ashes, dust to dust" and head back to their car. When Mimi calls you on the phone to tell you to hurry, it’s just as funny. And, the other sounds are superb as well. The only part that I didn’t care for was the music, but that can easily be turned off in your options menu. And, its not that the music is bad, it’s just repetitive and got a little old. 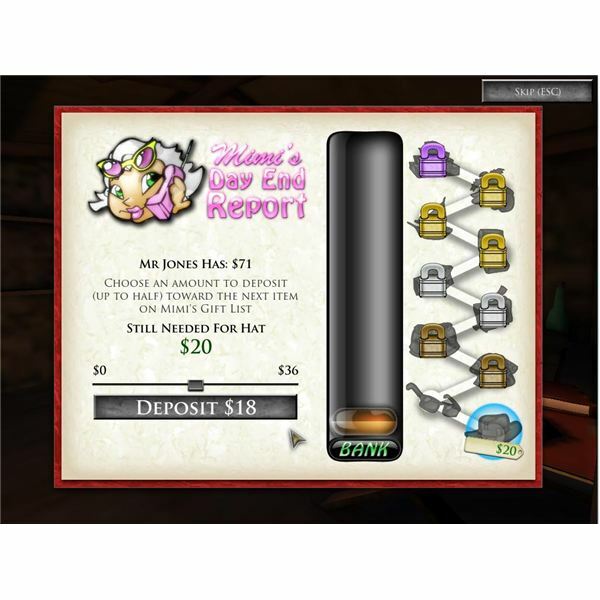 For those that love time management games as well as PC strategy games, like Cooking Dash, Cake Mania, or the like, you’ll love Mr. Jones’ Graveyard shift. It’s funny, it’s challenging, and everything that you do in the game does require some planning and thought. The tutorial is great, the game is great, and I would easily recommend it to anyone who wants a great game to add to their collection. The best part is that it is for any age or gender of gamer – so you can easily allow your kids to play this one as well and not worry about it. Go over to Big Fish Games and get this one today to start enjoying it.